Duchess Kate: Princess Charlotte to be Christened on 5 July & Photos of George and Charlotte to be Released! 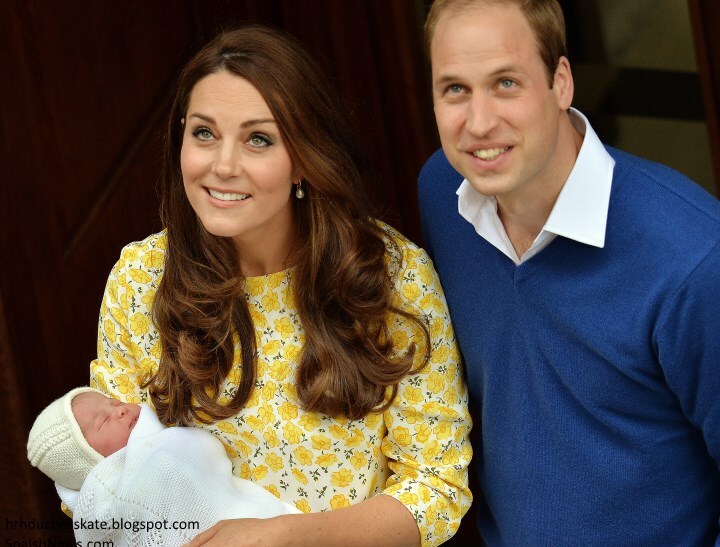 Princess Charlotte to be Christened on 5 July & Photos of George and Charlotte to be Released! Kensington Palace announced today Princess Charlotte will be christened in the Queen's parish church in Norfolk on Sunday 5 July. 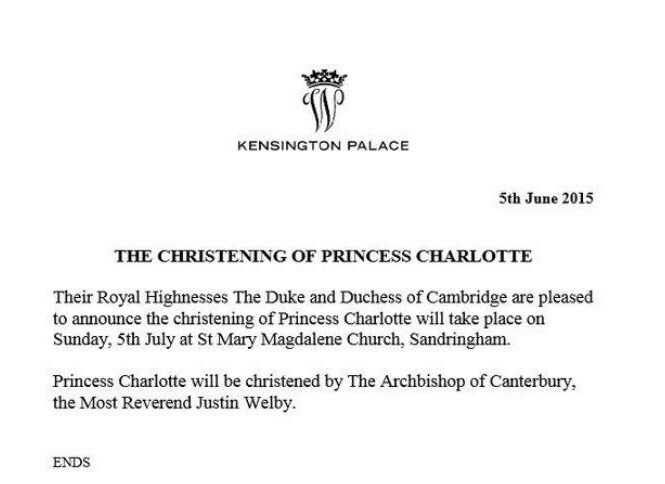 Princess Charlotte will be just over two months old at the time and will be christened by the Archbishop of Canterbury, the Most Reverend Justin Welby. The Palace confirmed the service itself will be "private", however some well wishers will be permitted to gather outside. William and Kate's choice of venue was partly chosen due to its proximity to Anmer Hall, and of course it has quite the history with royal christenings. The late Diana, Princess of Wales was baptised there and more recently Princess Eugenie received the sacrament there during a public service in 1990. 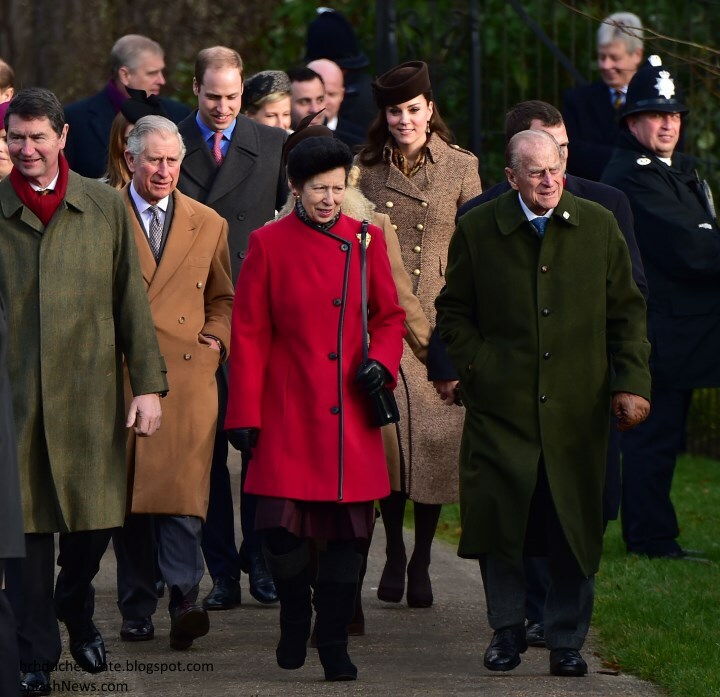 You will all be familiar with photos of the royals walking to St Mary Magdalene Church each year on Christmas Day. 'Princess Charlotte's late grandmother Princess Diana, who was born at Park House, Sandringham, was christened in the church on August 30, 1961. 'The choice was made because of the Royal family’s close connection to that church. Princess Charlotte will be the most senior member of the Royal family to be christened outside a royal residence for 120 years. The Duchess chose an elegant bespoke Alexander McQueen ensemble for Prince George's christening at the Chapel Royal, St James's Palace and no doubt we'll see her selecting an equally regal look for her daughter's christening. Princess Charlotte will wear the same gown her brother wore for his christening in October 2013. It is a hand-made replica of the royal christening robe, made by Angela Kelly, dressmaker to the Queen. The original Honiton lace and satin robe, which is now 172 years old, was last used in 2004 with Lady Louise Windsor being the last royal baby to wear the piece. After years of wear it had become too fragile to use, so in 2008 the Queen commissioned a replica. It features the same length skirt, elaborate collars and bow as its predecessor. The first baby to wear it was was James, Viscount Severn, son of the Earl and Countess of Wessex. Princess Charlotte's godparents' names will not be released until closer to the date, however speculation is already mounting about who they may be. Princess Beatrice has been suggested as a strong possibility along with William's cousin Peter Phillips, Prince Harry, Pippa and James Middleton and Hugh van Cutsem. As with Prince George's christening, it will be a small, intimate affair attended by godparents and their spouses and close family. The choice of location was an excellent one, with plenty of royal history but also a personal one given its connection to Diana. Anmer Hall is very much the Cambridges home now and will continue to be their primary residence for some time to come. 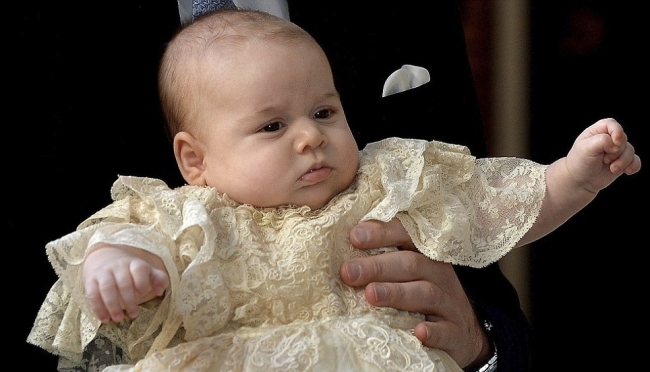 Similarly to George's christening, we expect to see arrival photos on the day, before official photographs are taken. It should be a wonderful event. UPDATE 6 June: Kensington Palace has confirmed photos of Prince George and Princess Charlotte will be released tonight. The four photos were taken by Kate in mid-may at Anmer Hall. They'll be released via Kensington Palace's Twitter Feed from 9 p.m. Thank you! Looking forward to the photos, I see HM has given Harry a Roysl honor, well deserved. Our reigning Horse of the Year, California Chrome, is expected to run at Roysl Ascot June 16. His silks are purple and green. I hope the Queen chooses one of those colors by coincidence, for a bit of luck. How lovely to hear of a special event such as this. Thank you Charlotte for covering it in your own inimitable style. I look forward to the event in July. Oh no, I had not thought of that. I hope we get a family picture soon! Can't wait to see everyone at this event!!! Is it really true that Amner Hall is their full time home? They never said that, did they? This is something that the press started to make them look wasteful after Kensington Palace was renovated. I'm certain they will be going back and forth between their country and city homes, just like every other wealthy family with multiple homes does. I too wonder about this. They may want it to be but who knows if they are planning beyond two or three years. At present they require both city and country homes. Even middle class families have city homes and cottages in rural areas. Of course, William & Catherine will want to raise their family at Anmer Hall where there will be greater privacy. However, they also need their own home in London. Being royals, their city home is in palace. No big deal whatever the press wants to make of it. They sensationalize everything and aim to stir up controversy at every opportunity. The updates to KP will, no doubt, last whoever gets that apartment next into their dotage. Nothing wasted there. With Wills & Kate at Anmer Hall, that also has them conveniently close and eases the overcrowding at Sandringham over Christmas--the servants having to twin up and all that. Philly, I agree. I believe they will live at KP for many years to come. Apartment A1 has the privacy that BP does not offer (a separate apartment vs. a section of BP) and it doesn't/won't have the current history of CH. City and country homes are de rigeur in their set, not necessarily required, and certainly not required in their case. The drive from Anmer to where William works is almost the same as the drive from London to where he works. So the reason given to go live there was disingenuous at best. Not sure how a house in the wide open is more private than a house in London with a private walled garden either, although I suppose by virtue of fewer people when they step outside they are seen less in Norfolk. And I don't care what you say. Spending £6 million on one place -- £4.5 million of it not their money -- and then decamping virtually immediately is very wasteful when those renovations could have been deferred and something more urgent done with the money. The press didn't have to work on that one at all. I so want to see a picture of the family as they did with George! Why have they not released a picture yet? What is the harm in letting the public see a family photo which we only get about once a year... I wish KP would address the issue, admitting that there will be no photo or there will be. It does strike me as odd that the couple is absolutely so private with their lives when they are public figures. I obviously agree with them wanting to drive away from the public, but sometimes I think they take measures to extremes. Seeing a photo of will and Kate intrigues all of us because we almost feel as we are a part of them, and it makes it seem like they are us. But I'm eagerly waiting to see a photo like the one Michael Middleton took. I think that it hasn't been released might have been partly because of Harrys tour, Charles and Camilla in Ireland (which is huuuuugely important) and now the celebration of WI. It's a timing that has to be found not to overshadow any other major event. So glad we're finally hearing something! I do also speculate that they won't be releasing any photos prior to the christening. This is a shame as I think it would have been nice to have a more private photo released as well as the christening photos. I could be wrong though! Also, their decision to have the christening in Norfolk surprised me. I don't understand why they couldn't do it in London? Everyone is always criticising them for hiding away - especially when it became obvious they would be spending most of their time at Anmer Hall quite soon after the renovations at KP were completed. And then there was the warning sent out to the media that it was a private estate, etc. I don't see why they couldn't keep it private and have it in London like they did with George. Maybe it's similar circumstances as to why Princess Eugine was christened there? Even so, Princess Charlotte is 4th in line to the throne and Prince Harry, the "spare heir", was christened in London. They live in Norfolk. Prince William will be working and it is closer to where they currently reside. They have 2 homes, such is life. Princess Charlotte's christening will be a family event, therefore they may prefer a smaller, more intimate church. Also, Princess Diana was christened in this church. It makes sense. Henrietta, I just posted a similar comment on another blog. :) I agree with you and I do not see this as any less significant for exactly the reasons you cited. If they chose a London setting at this particular time, the people in Norfolk (where they live and their privacy is being respected) could feel slighted. Hope this doesn't post twice. Does anbody really think Rebecca Deacon will be chosen for a godparent? I've been spectacularly wrong before. It could happen. I could not agree more royalfan. I think it is lovely that they are showing the local community in Norfolk that even though they have much of their royal duties and life in London, they are also very keen to create lasting memories and become part of the local community of Norfolk. It is a definite nod to their new environment. Only the direct heir to the throne was christened in a public ceremony in the past. Princess Charlotte christing will be more private more direct family members. 99, I think the Queen spends most of her weekends at Windsor (especially at this time of year) so I do think this has more to do with the other factors already mentioned. They are valid questions 99. I doubt that they would choose Rebecca Deacon. But hey, who knows!!! Maybe The Queen will be at Sandringham? Before going to Balmoral? Complete speculations on my behalf. Maybe Charlotte/Admin knows? Your post makes sense Sam, thank you. Why does it matter whether it's in London or not? It has nothing to do with you where a married couple christen their child and you're just adding to the criticism they get. They've still chosen a place with Royal connections and they're allowed to baptize their child any place they want. And even if you live in London...it still doesn't impact you because it would still be private and you wouldn't have been able to attend in anyway. Have you heard this from Royal Reporters or KP? And now there's going to be pictures of Prince George that were taken by Kate herself released tomorrow! I wonder if the family pictures will be released at the same time? I am waiting impatiently for these new photos. Lol. I am curious to see what the Duchess will be wearing to her daughter's christening. I would love to see the Duchess wear the same outfit she wore to Prince George's christening.....it would be so much like her....and that is a total compliment! In a way I agree Bonnie. As a way of taking the focus off her clothes. I think she purposfully choose a cream dress to blend in. And maybe another hat or something so we can be able to tell the pictures apart :P But in a way, Charlotte will have so many other things that she will be "less important" than her brother, so mommy not bothering to buy new clothes might be a little to much. Maybe a new cream dress and the same hat? Hi Charlotte, thank you again for a wonderful post. I think it's lovely that they are christening Charlotte in the same church as her grandmother. I'm sure that Diana is smiling down one her. I hope we get to see photos soon, of the little family. I'd also like to see a side by side comparison of siblings in the same christening gown. I think that would be adorable. So here's something I'm curious about since the godparents speculation has popped up again. Basically all of George's gp's are either a relative of William, friend of William that then became Kate's friends after she began dating him, or some kinda royal aide, advisor that again knew William first. I don't understand why Kate didn't get a relative from the Middleton side. If not Pippa because like it's been said she nor Harry don't really need to be picked because as aunt's and uncle's their impact will be much greater than being an honorary godparent, but maybe a cousin? If the rumor is true that another one of Wills cousins will be picked. Didn't she go to a cousins wedding a few years ago even though it caused controversy because it was at a hotel that doesn't support LGBT rights? If William and Kate are trying to maintain a balance between both sides of the family like it's been said numerous times before and shown by inviting Middletons to Christmas at Sandringham, spending Christmas at Bucklebury, and always seeming to make an effort to include the Middletons. Wouldn't it make sense to have someone from Kate's side of the family(exception of Uncle Gary) as a godparent. And not keeping with royal tradition of only picking royal relatives or friends of royals, advisors, etc that knew that person before they were married. Apparently Diana was upset because all of Williams gp's were old and friends of Charles. Is Kate close to anyone besides her family on the Middleton side? If so I think it would be nice if someone would be chosen as a gp for Charlotte. I think one of George's godmothers was a school friend of Kate's but apart from that you're right. To me it seems as though she doesn't have a lot of friends that weren't William's first though, so maybe that's why. I've never heard about her being close to any cousins or such but I could of course be wrong. I think there will be more leeway for the choice in godparents with Princess Charlotte where she is not the heir. I wouldn't be surprised to see a member of the Spencer family on the list this time such as Emily McCorquodale (sorry don't remember her married name off the top of my head) or Eleanor Fellowes. It doesn't seem that her immediate family is close with other relatives. I think the godparents will likely be more associated with Will's family than hers. I don't think Harry or the York girls will be selected. Many of the photos now being shown, were not seen at the time. I expect Sunday is convenient because members of the family seldom have engagements on that day. I think it is lovely that they have again chosen a church and one with connections to William's mother.I always thought it rather odd when the family of the head of the Church of England chose a room in the palace for Christenings, rather than one of the numerous churches with which they are connected. YEA!!!! Looking forward to seeing them! Can't wait! Was getting worried about those photos. No Erika, Royalfan said the pictures would be taken by a non professional, a family member, and Kate is definitely a family member and a non professional! Taken by Kate: Royalfan, Camilla's hat is safe! You are right Paola! I forgot. The deal was if a professional photographer were used she would be eating the hat. Oh, Paola, I wish!! :))) My money was on Michael Middleton. Well, Royalfan, I think we will prepare a big big big sugar hat and send it to you... buon appetito! Thank you for an update Charlotte! I'm assuming the 10pm release time is GMT, correct? Looking forward to the photos that are coming later this evening! I think it is a beautiful tribute to have Princess Charlotte christened in the same church as her grandmother was. It is very obvious that Anmer Hall is home base and so it makes sense for the christening to be there. Such a special occasion and a day to look forward to for the Cambridge family! Diana will always be young to me. It seems so strange to think of her as a grandmother yet it's been over 30 years since I got up early to watch her wedding. Yay for photos!!! I'm a little sad that they won't be family portraits, but if we're getting FOUR of them, I guess I can't complain. So excited to see the pictures. Thank you for the update Charlotte! And, I'm equally as excited to see Kate's photography skills. Why we are not able to see the christening procedure like any other royal family? Where does it say we will see four photos and that they were taken by Kate? I just see the announcement from KP that says a photo of PG and PC. "can't wait for everyone to see IT!" I agree on the principle of having both parents’ side family members for God parents, at least this time. I want to bet they will pick someone from Diana’s family, most likely her sister & family/ Lady Sara M. If they pick from Kate’s family, they might pick from Michael Middleton’s side. 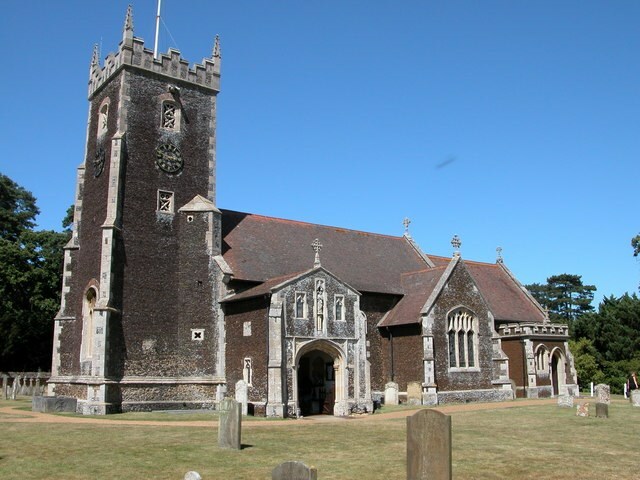 I like the choice of the Sandringham church (and wish the Queen would have the exterior cleaned of its mysterious black). I wonder whether St. Mary's Church around the corner from Anmwer Hall was considered, but of course Princess Charlotte should be christened in a royal church. 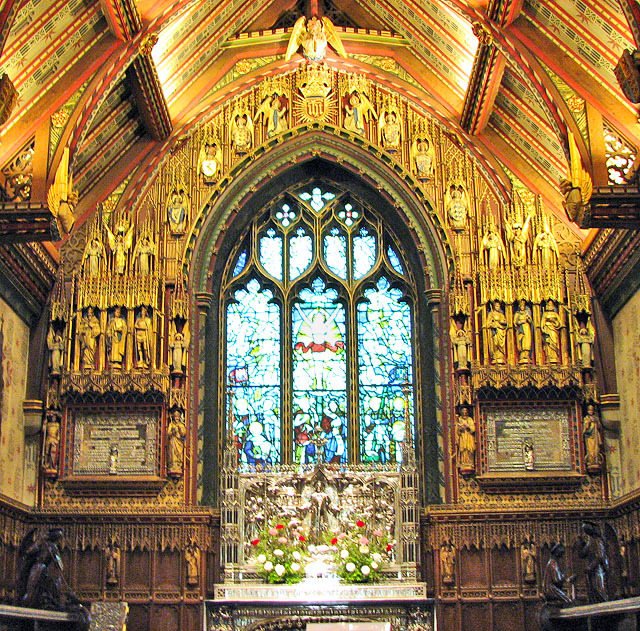 The interior of the church at Sandringham is so beautiful and so ornate compared to the outer walls. The choice of a time to release the four photos no doubt is to provide them to the Sunday papers. They should be available for the evening news in the U.S., so we may see them on our television screens as well as our computers tonight! It's on twitter. Have a look! It's beautyful! Photo's on twitter. Have a look. It's so beautyful! The picture is up on the Twitter feed. SOOOOOOOOOOO CUTE!!!!!!! I saw the photo of Princess Charlotte with your big brother and it is so sweet and adorable. She looks a lot like Kate side of the family with blue eyes but she is still developing and will surely change, Such excitement, I am beside myself!